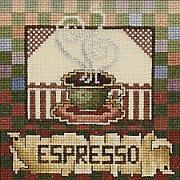 This pattern comes from The Stoney Creek Cross Stitch Collection, Sweet Gifts for Valentine's Day, February 2004 issue. This pattern would make a great gift for the Espresso drinker in your life. With Supplies: $34.63 You download the design. We will send you, 35 skeins of DMC Floss & Wichelt 14ct. 18" x 21" Aida (White) to complete your project.